While I continue to work on the choreography for my Ballet avec Dog Leashes, check out this number. Got to admit, that dog's got talent! The Blue Grosbeak is my latest 'life bird' spotted near the Angora goat pen at the Biltmore Estate's Farm Village. It's a strikingly beautiful bird with deep blue color and two brown wingbars. The sturdy delta shaped beak in silver gray is the giveaway feature linking this bird to it's northern cousins. 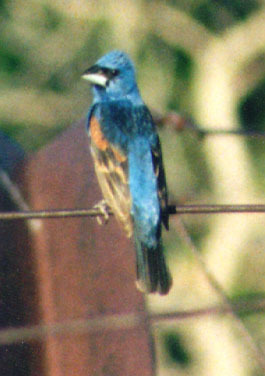 The range of blue grosbeaks has expanded northward over several decades but it still is most commonly found in the Southeast. The Blue Grosbeak's habitat includes fields at the forest edge, along power-line cuts, river banks, hedgerows and areas with medium sized trees and low shrub. Preferred foods include insects, seeds, and -- I know from first hand experience--Angora goat feed. One of the greater mysteries of nature is the annual migration of Monarch butterflies from the northeast United States and Canada to the Transvolcanic mountain range in Michoacan, Mexico. An estimated 200-500 million Monarchs arrive in the high elevation in late October where they winter in a semi-hibernation state until the warm winds of March awakens them to begin migration north, feeding on milkweed and breeding as they go. Scientists believe no single butterfly makes the entire two-way trip, rather it is thought three to five generations are necessary to complete the cycle. Scientists also do not fully understand how or why the Monarchs make the 2,500 mile multi-generational migration, nor do they know why the dense growth of fir trees 8,500 feet up in these particular mountains attract them. On arrival the Monarchs settle in the thick boughs of fir trees and cling motionless in huge numbers unless disturbed or prompted by changes in temperature to move up or down the mountain. Naturalists only discovered in the 1970s that Monarchs migrated at all when they stumbled across their remote Mexican mountain destination. 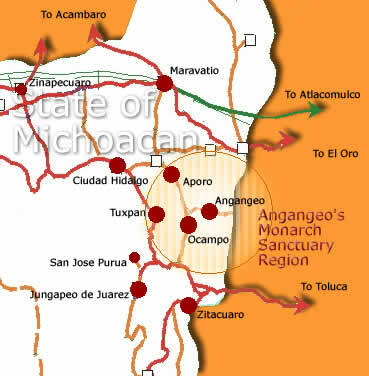 Now a butterfly sanctuary has been established near the village of Rosario for the protection and study of the species. In the folklore of the Aztecs, the native people of Northern Mexico, Monarchs were thought to be the souls, reborn, of fallen warriors wearing the orange and black colors of battle. Like most wildlife the primary threat to existence is loss of habitat. So too are Monarch butterflies threatened. Illegal logging in the region has resulted since the 1970s with nearly 50-percent of their wintering grounds destroyed. An unusually harsh winter in 2002 with heavy rains and a killing cold caused an estimated 75-80 percent that winters population of 200-500 million butterflies to perish. But scientists believe the species survived that decimation and has recovered. Numbers of migrating Monarchs in recent years have returned to normal. A new Saint Louis University study shows there is some truth in the old cliché that describes a dog as "man's best friend." "Or at least a less aggravating friend," said study author William A. Banks, M.D., professor of geriatrics in the department of internal medicine and professor of pharmacological and physiological sciences at Saint Louis University School of Medicine. "It was a strange finding," said Banks, who also is a staff physician at Veterans Affairs Medical Center in St. Louis. 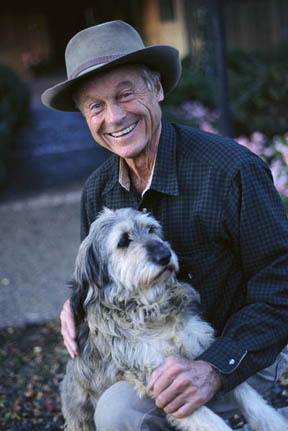 "We had thought that the dog acts as a social lubricant and increases the interaction between the residents. We expected the group dog visits were going to work better, but they didn't. "The residents found a little quiet time with the pooch is a lot nicer than spending time with a dog and other people," he said. Thirty-seven nursing home residents who scored high on a loneliness scale said they wanted to receive weekly, 30-minute visits from dogs. Half spent time alone with the dog, and the other half spent time with one to three other nursing home residents and the dog. While both groups felt less lonely, the group that had one-on-one quality time with the dog experienced a much more significant decrease in loneliness after five to six weeks of visits. The main way pets reduce loneliness in nursing homes is simply by being with people, not by enhancing socialization between people – for instance, giving nursing home residents something to talk about or an experience to share, Banks said. Discovered by wildlife rangers near certain death in the Indian Ocean off Malindi, the one year old male hippo calf named Owen was placed on 27 December 2004 in Haller Park, a wildlife sanctuary near Mombassa, Kenya. As soon as he was placed in his enclosure, the orphaned younster immediately ran to the giant toroise named Mzee (Swahili for 'old man") also kept in that space. Mzee is estimated to be between 100 and 130 years old. Mzee was not immediately taken with Owen, he turned and hissed forcing Owen to back away. 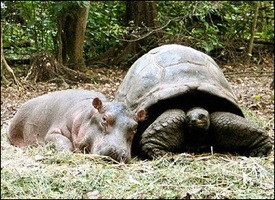 But Owen persisted in following the tortoise around the park and into the pool and within days the unlikely pair had forged a friendship, eating and sleeping together. Owen has even been seen to lick the tortoise, whom he regards as his new mother. Wildlife workers speculate that Owen may have been attracted to Mzee as a parental figure because the tortoise's shape and color are similar to an adult hippopotamus. Among the thousands of crushing moments from last week's deadly hurricane, one image brought the anguish home to many: a tearful little boy torn from his dog while being shuttled to safety. The boy was among the thousands who ended up sheltered at the Superdome after the hurricane. But when he went to board a bus to be evacuated to Houston, a police officer took the dog away. The boy cried out — "Snowball! Snowball!" — then vomited in distress. Authorities say they don't know where the boy or his family ended up. Some witnesses called Snowball a terrier mix, while others consider the dog a bichon frise. If the boy and his dog are indeed safe, they have beaten long odds. Many of the animals — dogs, cats, ferrets and birds — that police collected at the Superdome were herded into a stairwell until the human evacuation was complete. Of the 50 animals rescued from the Superdome on Sunday, not all of them survived. More than 600 displaced pets remain in Houston. Hundreds more fill kennels and cages in Dallas and around the state. Shelters try to arrange foster homes for pets, and many families have volunteered. "We had dogs that swam the entire time in 4 feet of water and survived," said a pet rescue worker "Even cats were in about 8 to 9 inches of water in the upper cages and they swam and survived, too. Just like everybody else, they're survivors." Reuniting Snowball and his owner will require work, patience and luck. Volunteers planned to make visits to shelters in the Houston area looking for the dog's owners. They were considering walking around carrying signs with Snowball's photo. They've been scouring shelters, posting notes on the Internet and making phone calls to track them down. One woman set up a Web site to help people pair up pets with their owners. Another set up a reward to encourage someone to come forward with information on Snowball's or the boy's whereabouts. "Everyone wants to know about Snowball," said Laura Maloney, executive director of the Louisiana Society for the Prevention of Cruelty to Animals. More about Snowball and other lost pets. Barbara Kingsolver likes to tell the story about the 16-month-old son of a nomadic Iranian couple who wandered away from a group of youngsters being minded by a teenage girl looking after children while their parents worked. For three frantic days the group searched inside the yurts in which they lived, turning over and looking under their meager furnishing believing the child to be nearby as he'd only just learned to walk and unlikely he could have wandered far. When the child was not found the search extended to some caves set deep underground in connecting chambers. The caves were known to be occupied from time-to-time by bears and, indeed, as the searchers began their descent into the caves the odor of bears was overpowering. Were it not for the faint cry of what they believed was a human child the rescuers might have turn back. The child's father crept toward the back of the cave where, as his eyes adjusted to the darkness, he was able to make out the silhouette of his son in the embrace of a very large bear. How is it possible that a huge, hungry bear would take a pitifully small, delicate human child to her breast rather than rip him into food? But she was a mammal, a mother. She was lactating, so she must have had young of her own somewhere -- possibly killed, or dead of disease, so that she was driven by the pure chemistry of maternity to take this small, warm neonate to her belly and hold him there, gently. You could read this story and declare "impossible," even though many witnesses have sworn it's true. Or you could read this story and think of how warm lives are drawn to one another in cold places, think of the unconquerable force of a mother's love, the fact of the DNA code that we share in its great majority with other mammals -- you could think of all that and say, Of course the bear nursed the baby. He was crying from hunger, she had milk. Small wonder. I hope they didn't kill the bear but instead simply reached for the child, quietly took him up, praised Allah and this strange mother who had worked His will, and swiftly left the cave. I've searched for that part of the story -- whether they killed the bear. I've gone back through news sources from river to tributary to rivulet until I can go no further because I don't read Arabic. This is not a mistake or a hoax; this happened. The baby was found with the bear in her den. He was alive, unscarred, and perfectly well after three days -- and well fed, smelling of milk. The bear was nursing the child. Beginning mid-February and stretching to early June one of the largest raptor migrations in the world can be observed on the North Coast along the southern shore of Lake Ontario. Dedicated birders typically count upwards of 60,000 hawks, eagles, falcons and vultures enroute to their Canadian breeding grounds. Species observed include Broad Wing and Red Tailed Hawks, Bald Eagles, Osprey, American Kestrel, Peregrine Falcons, Snowy Owls and others. NAIROBI (Reuters) - A 120-year-old giant tortoise living in a Kenyan sanctuary has become inseparable from a baby hippo rescued by game wardens, officials said on Thursday. The year-old hippo calf christened Owen was rescued last month, suffering from dehydration after being separated from his herd in a river that drains into the Indian Ocean. "When we released Owen into the enclosure, he lumbered to the tortoise which has a dark gray color similar to grown up hippos," Sabine Baer, rehabilitation and ecosystems manager at the park, told Reuters. However, Owen's relationship with the Aldabran tortoise named Mzee, Swahili for old man, may end soon. The sanctuary plans to place Owen with Cleo, a lonely female hippo.